In today’s edition, we will cover Stock Dashboard – a comprehensive snapshot page presenting all the relevant details a trader should have on his dashboard before trading in F&O stocks. The price of the stock moves in a particular direction depending on numerous parameters.A trader or investor is flooded with heaps of data and indicators baffling him how to gauge the price movement based on these parameters. Also, a trader will have to go through various sources for a specific data thereby losing precious time and opportunity in collating all the data before taking a trade. Heckyl’s Stock Dashboard offers a concise and timely snapshot of a particular stock or an index after analyzing plethora of information available in the open market. 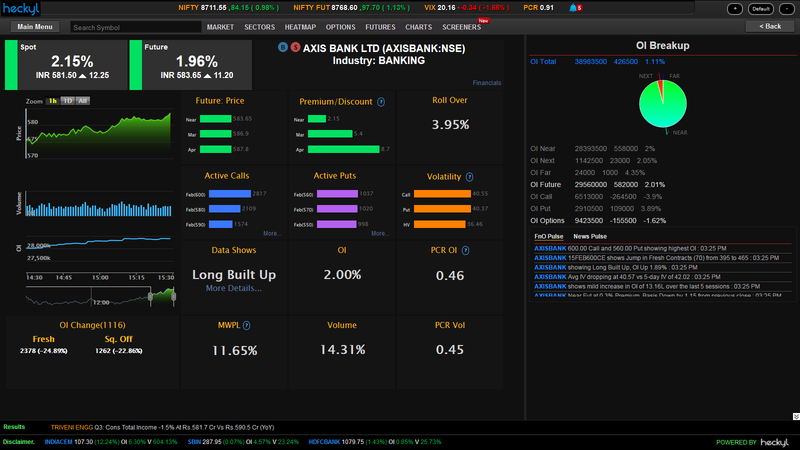 This dashboard also features news, charts and fundamental data along with F&O data so that a trader gets all the information in a single screen. Now let us understand all the features of this dashboard in detail. Spot and Future Live Price: It gives you the real-time stock and future price along with the absolute change and percentage change compared to previous day’s close price. Premium/Discount: Basis is calculated as the difference between Futures market price and Spot price. Positive basis represents that the Future is trading at a premium whereas negative basis represents that the Future is trading at a discount. Basis becomes zero on expiry day since Futures price has to match with Spot price at expiration. Monitoring basis helps to identify stocks with high premiums or discounts near to expiry and take offsetting positions in the Futures of those stocks and pocket the difference between the futures and stock price. The entire explanation is available to the user when he clicks on the question mark symbol next to Premium/Discount. Heckyl strives to enlighten the user with a detailed explanation of financial jargons in layman’s language so that the user understands the importance of a particular indicator and take smarter decisions using it. Active Calls / Active Puts: Active calls and puts indicates where the maximum trading is happening in options of that particular stock or and index based on the volumes. Around 95 percent of the total traded volumes come from the F&O market primarily from the options. A large part of trading community especially intraday traders scout to make easy money by writing options. Assume Nifty is up 100 points today, traders will look to mint money by writing out of the money put options with an assumption that the market will continue its upward journey in the short term. By looking at active calls and puts one can infer where the maximum action is happening in the option chain. By clicking on more the user can check the entire option chain of calls and puts. Implied Volatility: Implied Volatility represents the expected volatility of a stock over the life of the option. It is calculated by using volume weighted average of IVs of all options for that stock. The IV of each option is calculated by equating the theoretical price to the market price of the option in the Black Scholes option pricing model. IV becomes zero at expiration. Implied Volatility tells a trader whether the option premiums are cheap or expensive at the current levels. As expectations change, option premiums react appropriately. Options that have high levels of IV compared to Historical Volatility (HV) will result in high-priced option premiums. IV usually rises during events like Company results. One can monitor IV with its 22-day average gives insight of how the market is expecting the results to pan out. Advanced traders can take offsetting positions to short IV or hedge positions with neutral IV using straddle or strangle to smoothen out sharp volatility drops post results. Data Shows: This summarizes whether the long or short positions were created in a particular stock or an index by analyzing open interest, price and volume data in real-time. In order to get more accurate picture, Heckyl has made intervals of 15-minutes of the entire trading session (9.15am to 3.30 pm). OI (Open Interest): This depicts the percentage change in today’s open interest compared to the previous trading day’s open interest. This figure gives a broad picture which most traders are using it while Heckyl’s 15-Minutes Built Up screen gives a micro and accurate picture making it a standout feature. PCR OI / PCR Vol: Put Call Ratio OI is the ratio of total open interest of puts to total open interest of calls whereas PCR Volume is the ratio of put volume to call volume for that stock or an index. Monitoring PCR OI and PCR Vol together will give a valuable insight to traders. PCR greater than 1.4 is generally seen as a bearish indicator. It suggests most of the traders are confident of the current uptrend and they will write puts in huge quantities. Market has a tendency to shock investors and traders with a big correction when they get complacent and confident that market will not fall from current levels. 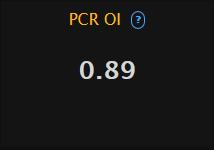 PCR less than 0.6 is generally regarded as a bullish indicator as excessive bearishness is prevailing in the market and retail traders or investors don’t want to invest anymore. Smart traders take this opportunity to pile up chunks of their favourite stocks looking at lower PCR OI in anticipation of a swift recovery from lower levels. OI Change: This further drills down the change in open interest in terms of fresh and square-off contracts. Fresh records new positions that were created today in a particular interval (long or short). Square-off indicates how many positions (intraday/positional) were squared off in the same interval. The percentage change figure indicates the change in fresh contracts created today compared to the previous day’s fresh contracts. MWPL (Market Wide Position Limit): Market Wide Position Limit or the maximum limit of open interest for securities in F&O segment across all exchanges. For stocks trading on NSE, the OI cannot go beyond 95% of MWPL else security goes into ban period and clients can only close their existing open positions through Long Unwinding or Short Covering. The normal trading resumes only after aggregate OI across exchanges comes down to 80% or below of MWPL. There are no market wide limits for index futures. Monitoring OI% of MWPL helps to track those stocks which are near their MWPL limit or witness sudden spurts in %MWPL as traders will look to offset positions to prevent the security from going into the ban period. Recognizing this information, investors can make informed decision beforehand on whether to go long or short in a stock near the 60% – 80% of the MWPL level. Volume: Volume suggests an increase or decrease in today’s volume compared to the previous day’s volume. A huge surge in volume is usually analysed along with the movement in price (up or down) to infer whether the current trend will persist or fade. This entry was posted in Home, Product Beat and tagged dashboard, Derivatives, F&O, future, Heckyl, Nifty, stock. Budget 2015: Smaller Speech, Bigger Vision! In the retail segment, Heckyl is offering the Futures and Options (F&O) analytics to brokers, through integration with the brokers’ trading terminals. These brokers are Angel Broking, Arihant Capital, Bonanza Online, Edelweiss ,Geojit BNP Paribas,Globe Capital,India Infoline,JM Financial ,Motilal Oswal ,Reliance Capital,Religare, SMC. So if you happen to be trading with any of these brokers , you can ask for Heckyl’s FIND Analytics in F&O. Depending upon the requirement and agreement with the respective broker firms we may provide all or some or only the key features with them. For accessing F&O analytics, a retail investor or the trader will need to get in touch with the respective Brokerage Houses to get guidance on the availability of the kinds, numbers of features or any other such related questions like demo etc. Hope this addresses your question.Thanks for writing in.